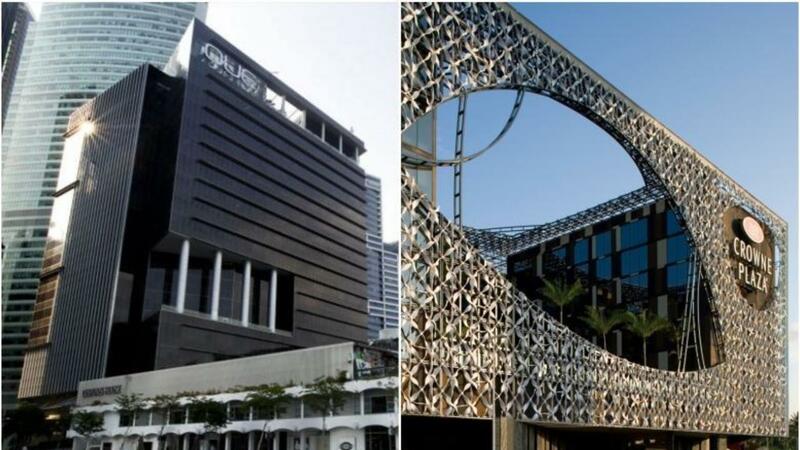 OUE Commercial REIT (OUE C-REIT) and OUE Hospitality Trust (OUE H-Trust) are proposing to merge in a cash and stock deal where OUE C- REIT will acquire OUE H-Trust by paying OUE H-Trust unitholders, $0.04075 in cash plus 1.3583 new OUE C-REIT units. Per 1,000 units of OUE H-Trust, unitholders shall receive $40.75 and 1,358 new OUE C-REIT units. As a result, almost 2.5bil new OUE C-REIT units will be created as part of this deal. OUE H-Trust will be delisted after the merger. Parent company OUE Group will continue to retain a 48.3% in the enlarged REIT. The enlarged entity will be among the largest diversified S-REITs with total assets valued at close to S$6.8bil. OUE C-Reit last traded at $0.52 for a market capitalisation of $1.49 billion while OUE H-Trust closed at $0.735 for a market valuation of $1.34 billion just before the trading halt was called on 08-Apr-2019. Post announcement, both traded down to close at $0.51 and $0.71 respectively for the week on 12-Apr-2019. It would seem that the market didn’t get too excited over this deal. What Benefits Does This Merger Bring? Our first impressions that such a merger between commercial and hospitality assets have little synergies. 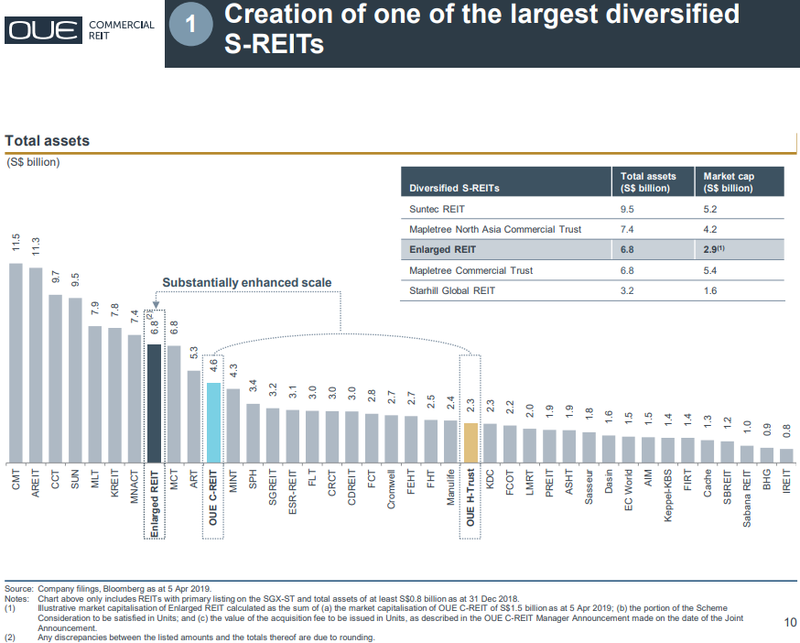 There are no REITs in Singapore today that have both commercial and hospitality components in the same portfolio and we struggle to explain how such diverse asset classes can complement each other. We were also not able to identify the explanation within the joint announcements. Perhaps the synergies will be come clear sometime in the future. But bear in mind that if the market is not able to make out the benefits of the synergies, the upside post-merger will be somewhat limited. 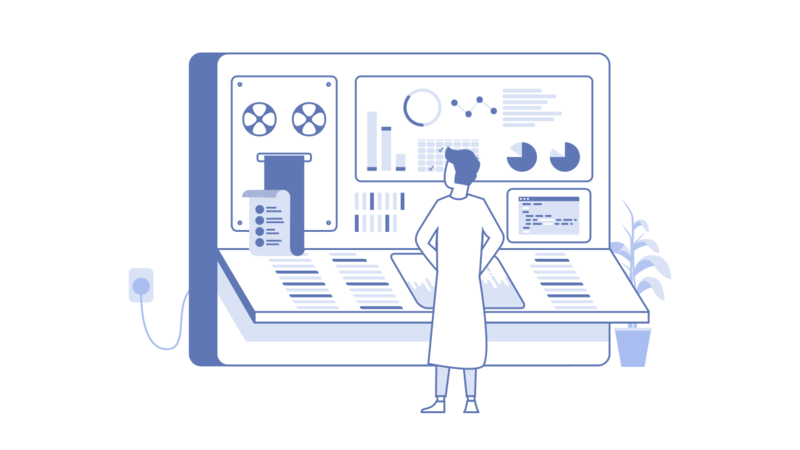 However, we do believe that with an increased asset portfolio, the enlarged entity could potentially gain from economies of scale and access to capital funding. For example, with a larger combined debt, the enlarged entity could potentially negotiate better interest rates and reducing the interest cost. A larger REIT also enables more efficient use of equity and debt-based fund raising in order to raise capital for future acquisitions. 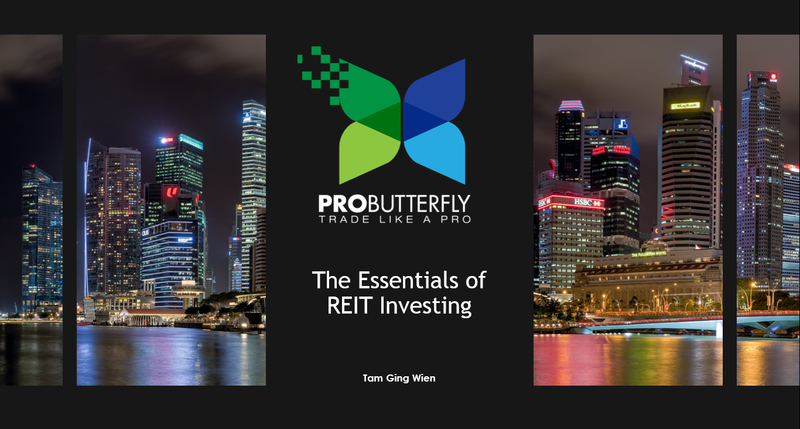 Together with an enlarged market cap, trading liquidity could be boosted and hence attracting more institutional investors in the REIT. 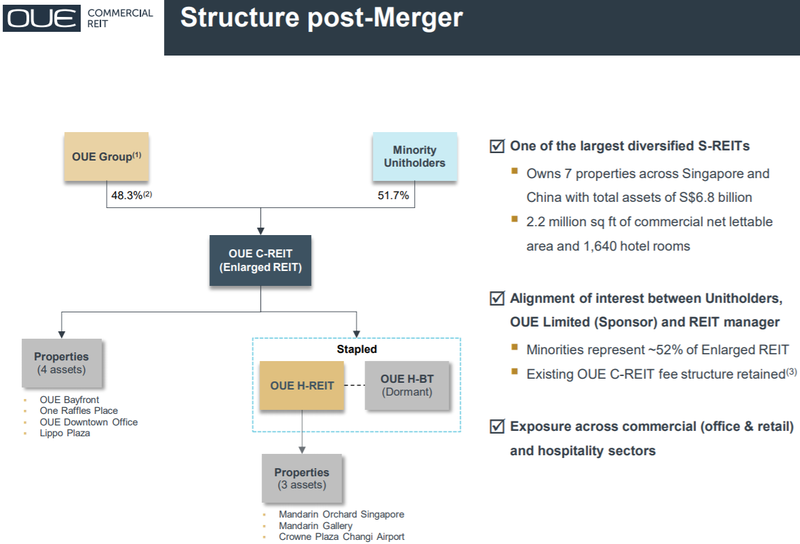 Could OUE Be Positioning for a Divestment of its Assets into the Trust? Since we concluded that there are little synergies other than to help facilitate fund raising and lowering their cost of debt, could it be possible that OUE could be positioning to divest assets into this enlarged trust? While we cannot rule out the possibility that the enlarged entity would be targeting other assets including overseas assets, we are on the opinion that Oakwood Serviced Apartments is likely the acquisition target considering it is a rights-of-first-refusal (ROFR) asset from OUE H-Trust’s perspective. Why Not Just Acquire Directly? Why Bother with a Merger First? This is a good and reasonable question to ask. 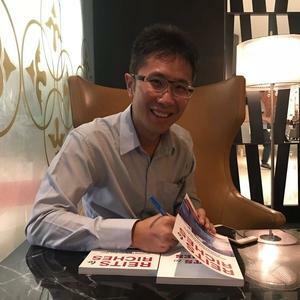 We think that the answer lies in the fact that both OUE C-REIT and OUE H-Trust’s share price now way below its book value, therefore attempting to launch any form of equity-based fund raising (e.g. rights issue or private placement) would cost too much resulting is heavy dilution of existing unitholders. It is usual for equity fund raising to be at a discount to the current market price. Considering that OUE C-REIT had already raised one round during the OUE Downtown acquisition and hurting both OUE C-REIT and OUE H-Trust share price, a second fund raising round on depressed unit prices is unlikely to be accretive. According to the presentation slides, the enlarged REIT will be able to raise almost S$1,024mil in additional funding, approximately 60% from equity-based while 40% from debt-based financing. 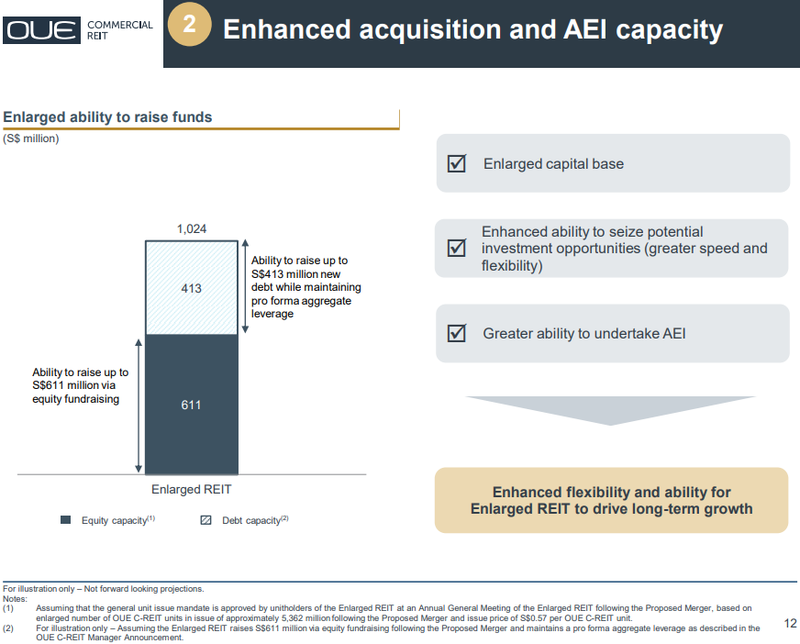 From the announcement slides, it is clear to us that the management has intention to acquire and execute asset enhancement initiatives (AEI) in the foreseeable future post-merger. The question is which one? Our guesses are on Oakwood Premier. As shared in the precious sections, we suspect that this merger is simply a precursor to another acquisition to come. Their ability to raise more capital after the merger would enable them to acquire more significant assets. We only hope that management will acquire accretive going forward. We have also worked out the impact of the merger on unitholders of OUE C-REIT and OUE H-Trust in the attached tables below with reference from the merger documents. 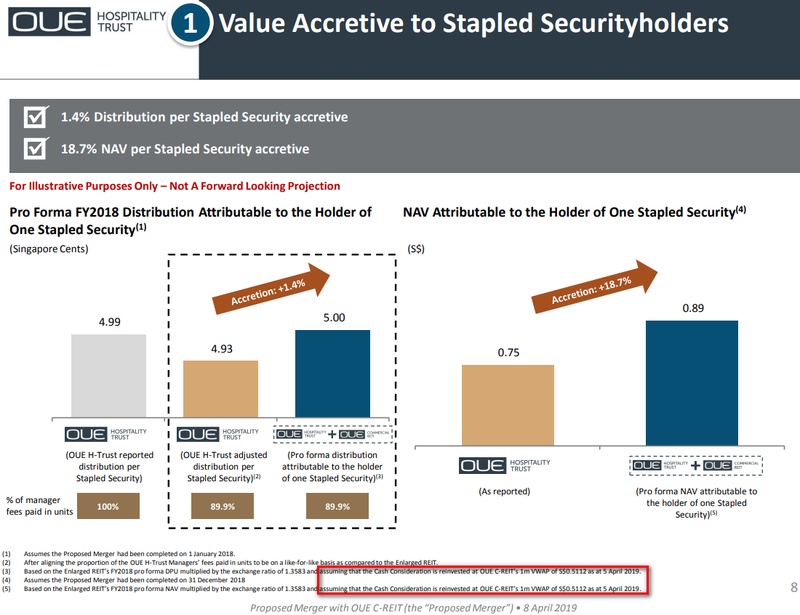 Existing OUE C-REIT unitholders will gain a small 1.88% DPU accretion but suffer a -12.88% NAV per Unit fall. Gearing will also marginally increase by 1.0% net from 39.3% to 40.3%. It is therefore likely that the market may adjust the valuation downwards to compensate by the decline in NAV per Unit. Existing OUE H-Trust unitholders will be given 1,358 new OUE C-REIT units for every 1,000 OUE H-Trust plus a one-time $40.75 cash component. As most investors are likely to just simply keep the cash component, we need to compare 1,000 OUE H-Trust units to 1,358 new OUE C-REIT units. Based on the above comparison, existing OUE H-Trust unitholders will suffer a fall in DPU from 4.99c to 4.72c, a -5.42% fall. NAV per Unit would also fall -17.3% from 75c to 62c. Gearing would also increase 1.5% net from 38.8% to 40.3%. Similarly, the market could adjust downward to balance the increased valuation due to the decline in NAV per Unit. The presentation slides show DPU accretive to both existing OUE C-REIT and OUE H-Trust unitholders as it makes a fundamental assumption that the one-time $40.75 cash component per 1,000 units is used to reinvest in more OUE C-REIT units therefore increasing the DPU. We are on the view that most retail investors will not do this and will simply just keep the one-off cash component which is approximately 82% of FY2018’s total distribution. We think that the impact to existing unitholders could be bias to the negative side for now as valuations using P/B Ratios would materially increase with no significant increase to the DPU. Personally, if we see this merger as a precursor to further acquisitions, our concern would be around accretiveness of those future acquisitions. 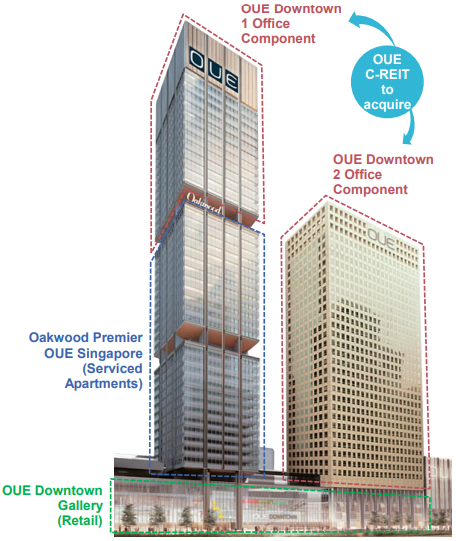 OUE C-REIT has in the past deals made dilutive acquisitions with the most recent one being OUE Downtown. While this does not mean future acquisitions also also be dilutive, from the perspective of a minority unitholder in OUE C-REIT but it does call into question the management's track record. Looking at the deal from a difference lens, OUE Ltd could be making use of the sale of its assets to raise funds to shore up its own cash holdings in order to support its own growth. Could some of the funds raised be used to purchase assets from Lippo Karawaci to help with their cash flow situation yet keep the assets within the Riady family control? We are not currently vested in either REIT and this announcement does not materially change our views to invest in either REIT.